You have to select a source for the audio input. 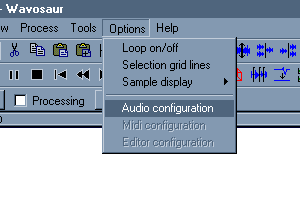 Go in menu Option>Audio configuration. Select the input for incoming audio in the "Audio in" tab. 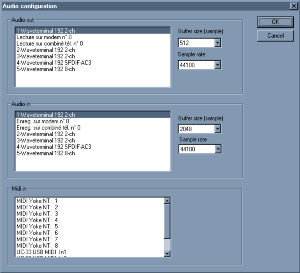 Select the samplerate in the drop down list. Select the buffer size in the drop down list :increase the size if you experience glitches in the recording. 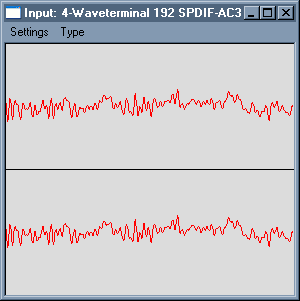 Optional : you can open the oscilloscope window to visualize and check the presence of the incoming audio. Menu Tools>Input osciloscope. The input oscilloscope window should display your input signal. If the display is flat, check the audio input chosen in the step 2. Click on the Record button start the recording. 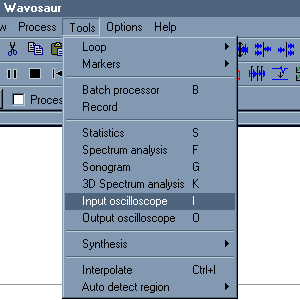 Depending on your audio drivers you can record while playing a sound with Wavosaur. To stop the recording you have to click on the Record button again (not the "Stop" button). The recorded data is appended at the end of the actual file. 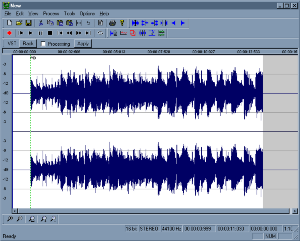 A marker is automatically inserted at the beginning of the recording. Best sampling rate for recording vinyl? Can i start/stop recording from the keyboard?